– squirrels are some of the most common attic animals. These cute rodents are quite destructive like the rats and mice. Squirrels will find entry using small holes, for instance, ones of one and a half inches in diameter. Once they enter the attic, they will make their sleeping place and will start defecating and urinating on the floor boards. – raccoons are also some quite annoying wild animals that are going to give you a hard time. 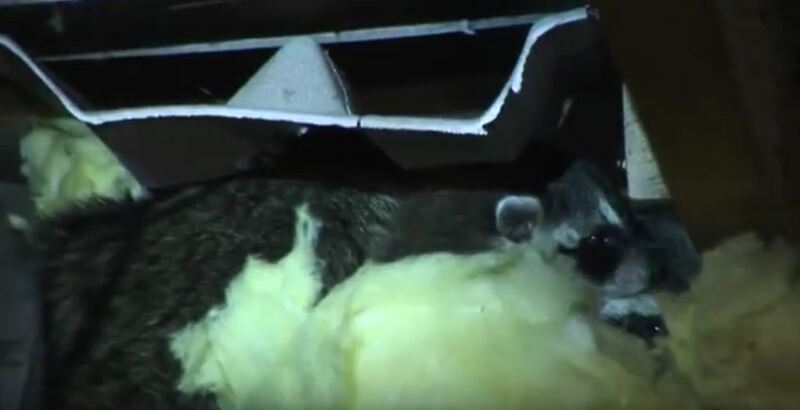 They are good at climbing and they gain entry by ripping open shingles, insulation and screens. They will also squeeze through eaves and through any available gap. Their poop is large like that of a cat or even a small dog. – rats are very common in most places. One problem with rats is that they always love to live near humans. Their relatively small bodies make it possible to gain entry using very small openings. They are also very good climbers. They are very messy because they chew things and leave thousands of droppings. – yes, snakes are also very good at climbing, and it is possible to find them in the attic. Sometimes they come looking for rats to eat. Snakes hardly make any noise, hence they are a bit hard to detect. There is a good chance you will find their old skin somewhere to indicate the presence of a snake. – opossums require a larger opening to enter, so they are not that common. Their droppings are fairly large and the possums themselves smell. – with a small opening such as a half inch, bats will squeeze and make a good home for themselves in the attic. Like snakes, they are silent visitors, so they are best detected by seeing them fly in and out. Go back to the How to Get Rid of Pests page or email us if you have any other questions about What are the most common types of animals that live in attics?